23 Examine me, O El, and know my mind. Test me, and know my thoughts. 24 See whether I am on an evil path. Then lead me on the everlasting path. forgiveness of self, of others who have wronged you and YAH forgiving you. REPENT = Say sorry but also TURN AWAY TOTALLY FROM YOUR WRONG DOING and do not look back or wish to return to it. What’s more, it doesn’t have to register emotionally. It’s an act of the will. We engage in mechila daily whether we know it or not. It’s not necessarily having the metaphorical slate wiped clean, but it’s enough. It’s not what we yearn for, is it? It’s not transformative forgiveness in which we are cleansed as white as snow, but our debt is cancelled. How many times do we owe someone an apology? How many times do we take a joke too far? How many times have we embarrassed someone or insulted someone or forgotten something important? How many times have we unintentionally hurt someone’s feelings? To err is human. If we have relationships, then we will be engaging in mechila almost daily. Here is the problem. Many well-meaning, or sometimes not so well-meaning, people expect others to apply the principles behind mechila to extreme circumstances where mechila no longer applies. Another Hebrew word associated with TESHUVAH is SELICHA (singular) and SELICHOT (plural). The following video illustrates the concept very well. Video: Really, Really Sorry: Slicha: An everyday Jewish idea for kids – Shaboom! This is where selicha becomes relevant. As Rabbi Kula explains, selicha is a process rather than a moment in time, and it’s not something we can ever expect or ask for. It’s a forgiveness born of a heartfelt empathy for the transgressor, and an ability to see the widest possible context, even the positive outcome of the conflict. Selicha takes time particularly if the hurt is great. It often unfolds in the course of living and growing together. Clearly, selicha is not mechila. What a refreshment and relief to see a religious leader finally differentiate between types of forgiveness. It is healing because there are those of us who have been browbeaten, judged, and alienated by people in religious circles for committing to the process of sechila while being told that we were, in fact, unforgiving and wrong. The truth of the matter is that not everyone can be lived with. There are abusers who will continue to abuse. There are unsafe people in the world who, given an inch, will take a life. And, there are those of us who do wrestle with forgiveness with great commitment. It’s just that our process and life may not look like someone else’s. Perhaps that makes others uncomfortable. Not everyone’s family looks the same. Not every child has a grandparent, and not every man and woman has a relationship with a mom or dad. We all must make our way and create a good life! We all must wrestle at some point! The principles of mechila cannot be applied here. Selicha is a process rather than an event. Sometimes it’s a lifelong process. Sometimes relational reconciliation is not possible. Nonetheless, selicha is still vital to our healing. Wrestling with forgiveness is still part of healing for our own well-being regardless of whether we will ever be able to return to a relationship with the person or group that harmed us. Note that MELICHAH and SELICHA/SLICHA are also known as forms of forgiveness. There is a third one also which is called KAPPARAH. The final form of forgiveness is kappara, and, according to Rabbi Kula, it is the forgiveness that we all yearn for. Kappara can only be granted by God. It can’t be earned or asked for. According to Kula, it comes after asking and all the work. It can’t be predicted or expected. It is the kind of forgiveness that wipes the slate clean. It cancels out the offense. Well, I want to emphasise that there is more than one way to forgive. That’s plain to see. So, if you have ever been judged or condemned because you have not been able to quickly bounce back from a painful situation and easily attain “relationship re-entry”, then I encourage you to let yourself off the hook. There’s a story about the Israelites receiving the second set of Ten Commandments on Yom Kippur…After forty days atop Mt. Sinai, Moses came down with the tablets. What could be more holy? But contrary to popular belief, these are not the set the Israelites received. When Moses saw the people worshipping the golden calf (a blatant defiance of the first three commandments), he did the unthinkable. He smashed the tablets in rage. Then he returned to the mountain for another forty days, during which time he managed to convince an even more enraged God not to destroy the people. When Moses returned to the Israelites he brought new tablets that he himself had created. These were the commandments the people received, and this is the event Yom Kippur remembers. There is no great moment of healing or repair in this story. Yes, of course, the people showed regret but, as in our own lives, the slate is not wiped clean. Something even more amazing happens. Moses places the old, smashed tablets in the Holy Ark along with the new, intact ones. The relationship continues; the covenant is renewed with the brokenness on the inside. There is no perfect reconciliation, no permanent forgiveness, nor forgetting. But betrayal is not the last word. There is a larger context. Love and betrayal can merge into and out of one another in astonishing ways. There is always a more enveloping pattern–and forgiveness is the most enveloping of all. Life is messy. People make mistakes. Sometimes they make horrible mistakes–repeatedly. Seemingly irreparable mistakes. As the tradition teaches, however, brokenness and wholeness are woven together. There is no magical moment when this happens. I do believe this. Pain does indeed coexist with healing, but the existence of pain doesn’t negate the healing attained. It just means that you’re human. You’ve lived. You’ve got life experience. With that life experience comes wisdom. Chametz (also chometz, ḥametz, ḥameṣ, ḥameç and other spellings transliterated from Hebrew: חָמֵץ / חמץ‬, IPA: [χaˈmets]) are leavened foods that are forbidden on the Jewishholiday of Passover. According to halakha, Jews may not own, eat or benefit from chametz during Passover. The month of Elul and the preparation for Rosh hashanah reminds to be ready for the soon appearance of KING YAHUSHUA our LORD. Though we do not know the exact day or hour of HIS return to possess HIS Kingdom on earth, we are commanded to watch and be ready for HIS soon appearance. We ought therefore to be in a state of constant TESHUVAH/Repentance as we seek to humble ourselves an walk with our YAH! 8 But what does it say? and with the mouth it is confessed for salvation. TESHUVAH implies a response to the person of YAHUSHUA HA MASHIACH that is demonstrated through confession that HE is none other than YAHUVEH’S only begotten son, the LORD of compassion and grace. The sound of the shofar is meant to awaken our hearts and to prepare for the coming judgement. 18 “Come on now, let’s discuss this!” says Yahweh. they will become as white as snow. they will become as white as wool. 14 If Ami, which are called by Shmi, shall humble themselves, and daven, and seek my face, and turn from their derakhim hara’im (wicked ways), then will I hear from Shomayim, and will forgive their chattat, and will heal their land. 5 For freedom, Messiah set us free—so stand firm, and do not be burdened by a yoke of slavery again. 2 Listen—I, Paul, tell you that if you let yourselves be circumcised, Messiah will be of no benefit to you. 3 Again I testify to every man who lets himself be circumcised, that he is obligated to keep the whole Torah. 4 You who are trying to be justified by Torah[a] have been cut off from Messiah; you have fallen away from grace. 5 For through the Ruach, by faith, we eagerly wait for the hope of righteousness. 6 For in Messiah Yeshua, neither circumcision nor uncircumcision has any meaning—but only trust and faithfulness expressing itself through love. 13 Brothers and sisters, you were called to freedom—only do not let your freedom become an opportunity for the flesh, but through love serve one another. 14 For the whole Torah can be summed up in a single saying: “Love your neighbor as yourself.” [c] 15 But if you bite and devour one another, watch out that you are not destroyed by one another. 16 But I say, walk by the Ruach, and you will not carry out the desires of the flesh. 17 For the flesh sets its desire against the Ruach, but the Ruachsets its desire against the flesh—for these are in opposition to one another, so that you cannot do what you want. 18 But if you are led by the Ruach, you are not under law. 19 Now the deeds of the flesh are clear: sexual immorality, impurity, indecency, 20 idolatry, witchcraft, hostility, strife, jealousy, rage, selfish ambition, dissension, factions, 21 envy, drunkenness, carousing, and things like these. I am warning you, just as I warned you before, that those who do such things will not inherit God’s kingdom. 22 But the fruit of the Ruach is love, joy, peace, patience, kindness, goodness, faithfulness, 23 gentleness, and self-control—against such things there is no law. 24 Now those who belong to Messiah[d] have crucified the flesh with its passions and desires. 25 If we live by the Ruach, let us also walk by the Ruach. 26 Let us not become conceited—provoking one another, envying one another. For the choir director; a psalm by David when the prophet Nathan came to him after David’s adultery with Bathsheba. 1 Have pity on me, O Elohim, in keeping with your mercy. In keeping with your unlimited compassion, wipe out my rebellious acts. 3 I admit that I am rebellious. My sin is always in front of me. 4 I have sinned against you, especially you. I have done what you consider evil. and you are blameless when you judge. 5 Indeed, I was born guilty. I was a sinner when my mother conceived me. Deep down inside me you teach me wisdom. 8 Let me hear sounds of joy and gladness. Let the bones that you have broken dance. and wipe out all that I have done wrong. and renew a faithful spirit within me. and do not take Ruach Qodesh from me. and provide me with a spirit of willing obedience. Let my tongue sing joyfully about your righteousness! and my mouth will tell about your praise. 16 You are not happy with any sacrifice. Otherwise, I would offer one to you. 17 The sacrifice pleasing to Elohim is a broken spirit. O Elohim, you do not despise a broken and sorrowful heart. 18 Favor Zion with your goodness. Young bulls will be offered on your altar. 4 If thou wilt make teshuvah, O Yisroel, saith Hashem, return unto Me; and if thou wilt put away thine shikkutzim (abominations) out of My sight, then shalt thou not be moved [to wander]. 2 And thou shalt swear, Chai Hashem, in emes, in mishpat, and in tzedakah; and the Goyim shall bless themselves in Him, and in Him shall they glory. 3 For thus saith Hashem to Ish Yehudah and Yerushalayim, Break up your unplowed ground, and sow not among kotzim (thorns). 4 Circumcise yourselves to Hashem, and take the mohel knife to the arelot of your levav, ye Ish Yehudah and inhabitants of Yerushalayim: lest My fury break out like eish, and burn that none can quench it, because of the evil of your deeds. 5 Declare ye in Yehudah, and publish in Yerushalayim; and say, Blow ye the shofar in HaAretz. Cry out, gather together, and say, Assemble yourselves, and let us go into the fortified cities. 6 Raise up a nes (a banner, a flag pointing to the place of refuge) over Tziyon; take refuge, delay not; for I will bring ra’ah (evil, disaster) from the tzafon (north), and shever gadol (great destruction). 7 The aryeh (lion) is come up from his thicket, and the Mashkhit Goyim (Destroyer of the Nations, i.e., Babylon) is on his way, he is gone forth from his place to make thy eretz desolate; and thy cities shall be made to lie in ruins, without an inhabitant. 8 For this gird you with sackcloth, lament and wail; for the charon af Hashem is not turned away from us. 9 And it shall come to pass at that day, saith Hashem, that the lev HaMelech shall be disheartened, and the lev hasarim; and the kohanim shall be horror-struck, and the nevi’im dumbfounded. 10 Then said I, Adonoi Hashem! Surely Thou hast greatly misled HaAm HaZeh and Yerushalayim, saying, Shalom yeheyeh lachem (Ye shall have shalom); whereas the cherev is near unto the nefesh. 12 Even a ruach maleh (strong wind) from those places shall come from Me; now also I will pronounce mishpatim against them. 13 Hinei, he [the approaching foe] shall come up like ananim (clouds), and his merkavot shall be like the whirlwind; his susim are swifter than nesharim (eagles). Oy lanu! (Woe unto us!) For we are ruined. 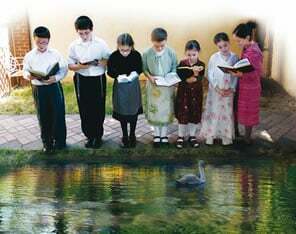 14 O Yerushalayim, wash thine lev from rah, that thou mayest be saved. Ad mosai (how long, how much longer) shall thy sinful machsh’vot lodge within thee? 15 For a kol (voice) declareth from Dan, and publisheth evil tidings from Mt Ephrayim. 16 Tell the Goyim; hinei, spread the news to Yerushalayim, that notzrim (besiegers) come from a far country, and raise their voice against the cities of Yehudah. 17 As shomrim of a sadeh, they are against her all around; because she hath been rebellious against Me, saith Hashem. 18 Thy derech and thy deeds have brought these things upon thee; this is thy wickedness, because it is mar (bitter), for it hath touched upon thine lev. 19 My innards, my innards! I am pained at my very lev; my lev is pounding in me; I cannot keep silent, because thou hast heard, O my nefesh, the kol shofar (sound of the shofar), the teru’at milchamah (battle alarm of war). 20 Shever (destruction) follows after shever; for the whole land lies in ruins; suddenly are my ohalim destroyed, and my canopies rega. 21 Ad mosai (how long) shall I see the nes (banner), and hear the kol shofar? 22 For Ami is foolish, they have not known Me; they are stupid banim, and they have no understanding; they are chachamim to do evil, but to do good they have no da’as. 23 I beheld ha’aretz, and, hinei, it was tohu vavohu [Genesis 1:2]; and HaShomayim—there was no ohr. 24 I beheld the mountains, and, hinei, they quaked, and all the hills had crumbled. 25 I beheld, and, hinei, there was no adam, and kol oph HaShomayim fled away. 26 I beheld, and, hinei, the carmel was a midbar, and all the cities thereof lay in ruins before Hashem, before the charon af Hashem. 27 For thus hath Hashem said, A wasteland shall be kol HaAretz; yet I will not make a complete end of it. 28 For this reason HaAretz shall mourn, and HaShomayim above turn black; because I have spoken it, I have purposed it, and will not relent, neither will I turn back from it. 29 Kol HaIr shall flee at the noise of the parash and the romeh keshet (the archer); they shall run into thickets, and climb up among the kefim (rocks); every city shall be deserted, and not an ish dwell therein. 30 And thou, O plundered one [Jerusalem], what wilt thou do? Though thou clothest thyself with scarlet, though thou deckest thee with jewelry of zahav, though thou paintest thy eyes with cosmetics, in vain thou adornest thyself; thy lovers will despise thee, they will seek thy nefesh. 31 For I have heard a kol (outcry) like that of a woman in travail, and in labor pain like that of her that bringeth forth her first child, the voice of Bat Tziyon, that waileth, that stretcheth out her hands, saying, Oy nah li (Woe is me now)! for my nefesh is weary because of murderers. Video: Rosh ha Shanah 2018 Celebration With Amightywind!